The new D750 is Nikon’s 3rd full-frame FX format camera released so far in 2014, following in the footsteps of the professional grade D4s and D810. The new Nikon D750 is targeted more towards the consumer market however and offers some mouth-watering specs for the serious enthusiast. For photographers who don’t need the 36Mp resolution from the D810, the D750 features a 24.3Mp FX sensor, boasting the same amount of pixels as the D610. Nikon state the D750’s sensor is newly developed however, so whilst offering the same resolution and Anti Aliasing filter as the D610, the D750’s sensor boasts an expanded sensitivity range of ISO 100 – 12,800 (expandable 51,200). What impact this modification to the D610’s sensor will make on the DxOMark sensor scores for the new Nikon D750 remains to be seen and we look forward to bringing you a full test in the very near future. 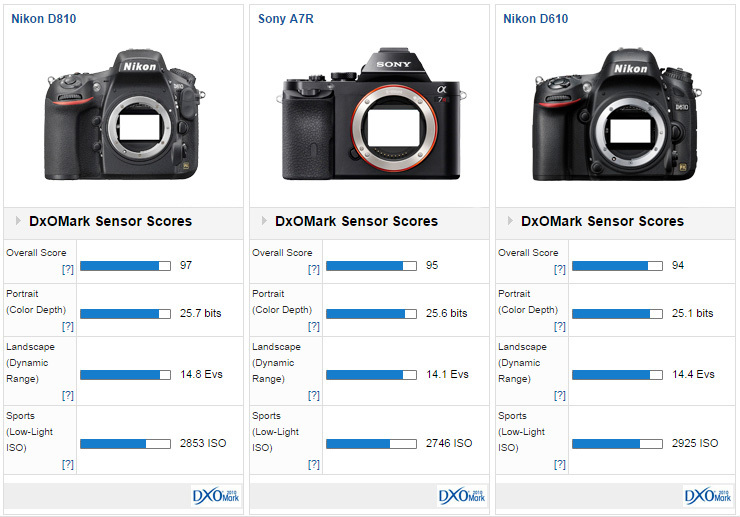 In the meantime you can see how well the 24.3Mp sensor inside the Nikon D610 performs against much of the competition. 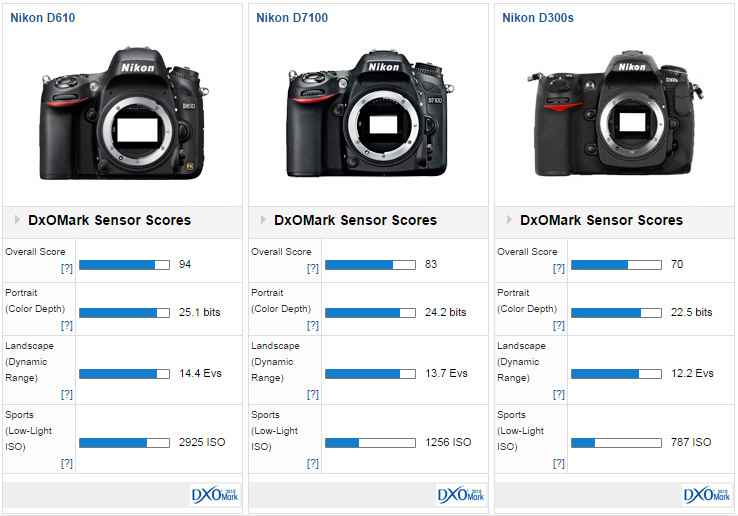 Compared to the other semi-pro or ‘prosumer’ full frame DSLRs from the main competition, the Nikon D610 wins in all categories and has a significantly higher overall score. 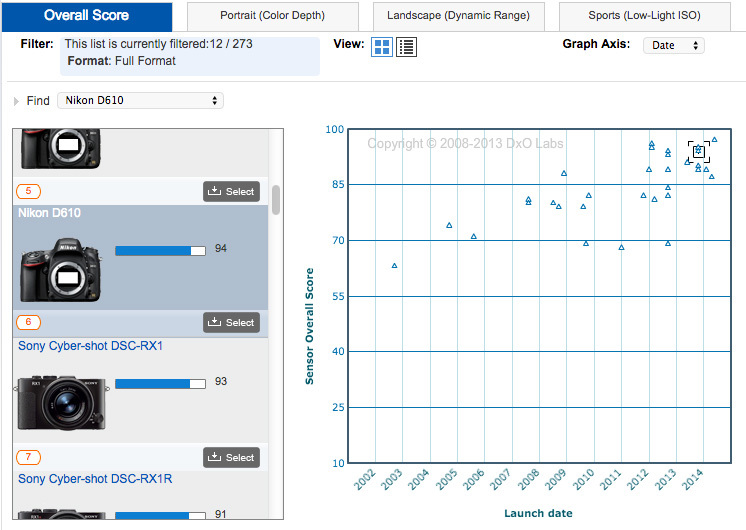 Recent releases suggest Nikon is encouraging enthusiasts away from APS-C sensors and with good reason. 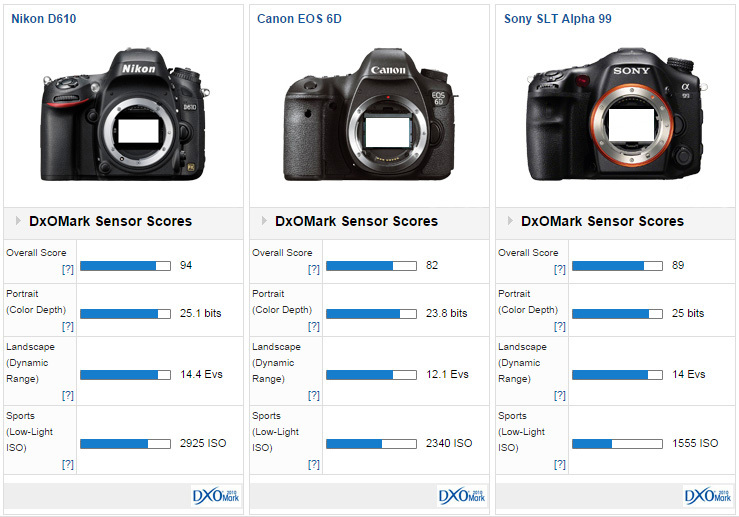 Compare sensor scores of the full frame D610 to Nikon flagship APS-C models. So we can expect big things from the new Nikon D750’s image quality and the rest if the specs don’t look too bad either. If you’re looking for more speed than the D810, the new D750 has an improved frame rate of 6.5fps in both FX and DX formats. For autofocus the D750 borrows Nikon’s 51-point Multi-CAM 3500FX II system from the D810, which with 51 targets boasts a greater number of targets than the D610. Nikon also claim the autofocus has been improved on the D750 with greater sensitivity for faster and more accurate focusing in low-light, compared to the D810, and there’s also the inclusion of a new Group Area AF mode. The frame rate has been improved over the rather sluggish 5fps from the D810, with the new Nikon D750 offering a snappier 6.5fps in both FX and DX formats. The Nikon D750 also borrows the ‘pro grade’ 91,000-pixel RGB metering system from the D800 and D4 series, which is a significant step up in metering performance from the 2016-pixel system found in the D610. There’s also Full HD 1080/60p video capture and videographers will be pleased to see a tilt screen LCD, a first for a Nikon DSLR, that swings open and tilts up 90 degrees and down 75 degrees. The LCD screen itself is the same 3.2in 1.2M-dot resolution model found on the D810, which also offers adjustable colour balance and brightness controls. Another first for a Nikon DSLR, the new Nikon D750 features integrated wi-fi for firing off shots direct from the camera and for media the new Nikon D750 boasts dual SD card slots. 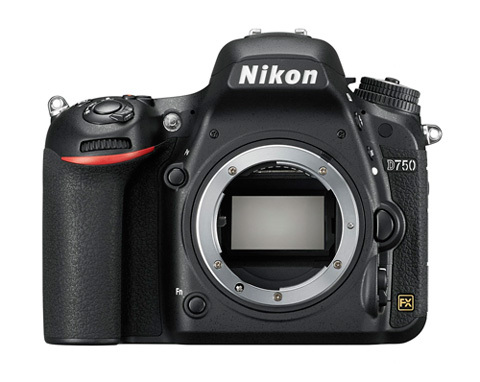 The new Nikon D750 will be available from the 23rd September 2014 priced at $2149.